The term Atkins Meat Diet is often heard because you may have heard that this is a diet where you can eat as much steak, bacon and sausage as you want. I’m here to tell you that it’s a misconception that you should keep in mind. 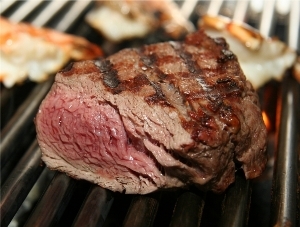 The Atkins diet does let you eat lots of meat, but it suggests moderation and that you eat mostly lean, low fat meats. The protein is what is important, not the fat. The Atkins Diet is often called the Atkins all meat protein diet because it places a great deal of importance on protein, which comes from meat in many cases. But you can also get protein from nuts, tofu, beans and other sources that are included in the guidelines. For instance, you can substitute natural peanut butter (the no sugar added kind) for a serving of meat and get lots of protein. Does the diet allow more meat in general than other diets? Sure it does, because many other programs rely on carbohydrates for caloric intake, which are strictly controlled on the Atkins plan. To keep your calorie level within a healthy range while staying low carb, Atkins allows more vegetables and meats. The key is the kind of meat – if you have read the “Atkins Diet Revolution” or any of the updated books on Atkins diet foods published since, you’ll know that he never suggested gorging on hamburgers and steaks every night. Beef is fine, but pork, fish and poultry were also featured as important lean meats for your weight loss. The Annals of Internal Medicine recently completed a study that confirmed that the Atkins Meat Diet will actually cause most people to lose weight faster than a conventional diet. That’s good news for people like you and me who get tired of nothing but salads! It also noted that it was important to follow all of the guidelines, including eating plenty of the suggested vegetables and taking a dietary supplement for good nutrition. Another reason the Dr. Atkins diet plan works even though you’re allowed to eat lots of meat has been suggested by the BBC. A recent study they funded fed two different groups – one group ate lots of meat and protein, the other group ate lots of carbohydrates. Neither had a limit to how much they could eat. The study showed that those who ate lots of protein actually felt full faster and ate less than those eating carbs. What does that mean for you? Well, if you like meat, cheeses and other foods on the Atkins Diet, you’ll naturally eat less than people on most other diets. I can tell you that when I ate foods on the Atkins plan, I didn’t crave sweets and snack foods like potato chips nearly as often and late night snacking was easy to pass up. I simply didn’t feel hungry. Just keep it in the proper balance – eat the portions suggested, keep the meats lean and don’t forget those vegetables! If you follow these steps, you’ll find that the Atkins meat diet is an excellent way to lose weight quickly. The key is balance and keeping in mind that you should follow the proper phases as your weight loss progresses. This way you will stick with it and see the same results I did without endangering your health.